Conducting a building energy performance assessment (BEPA) on a building involved in a commercial real estate transaction is a starting point for developing, evaluating and financing energy improvement projects, and the subsequent reporting of the measured energy savings. 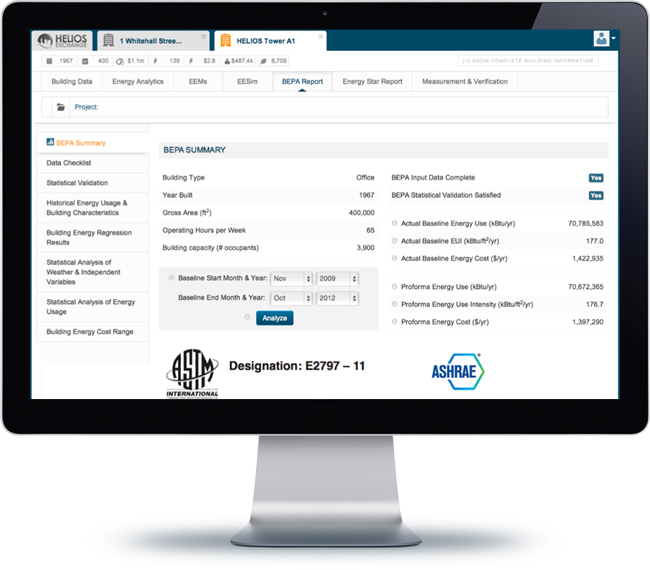 HELIOS BEPA™ (Building Energy Performance Assessment) provides simple and easy to use tools to benchmark, analyze, monitor and report buildings’ energy performance. Our technology is based on rigorous standards of energy performance for buildings, including ASTM BEPA E2797, IPMVP and ASHRAE 14 Guidelines.